RRB (Railway Recruitment Board) conducts NTPC EXAMs for graduate candidates under different posts as mentioned in RRB NTPC Vacancy. NTPC exams here means for Non-technical Popular categories. This exam is filled with most of the general Graduate candidates. Graduate of any stream are eligible for this recruitment. As per NTPC Vacancy this year exam is Computer Based Test (CBT) and common for all above mentioned post. This year a huge competition is there as you all know a large number of form filled at every Railway Board ranging from 80 thousands to 20 Lacs. You can check number of form filled at different RRBs here at erforum.net . So it is obvious that to crack this rrb ntpc exam candidates require to do as much practice of previous NTPC paper as they can. You should prepare this exam according to RRB NTPC Syllabus. 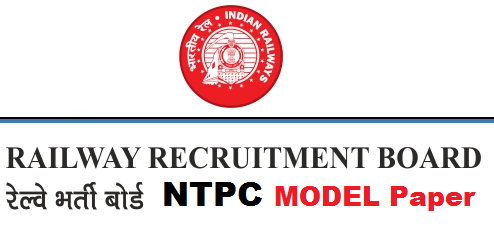 You can download RRB NTPC syllabus through this Link. Previous papers are already posted on this website. So here we are posting few model test to test your preparation of NTPC examination. Download Model Paper in PDF format from the below Table. These Model Paper are based on Memory. If you have any further query please do comment below , we will reply as soon as possible.